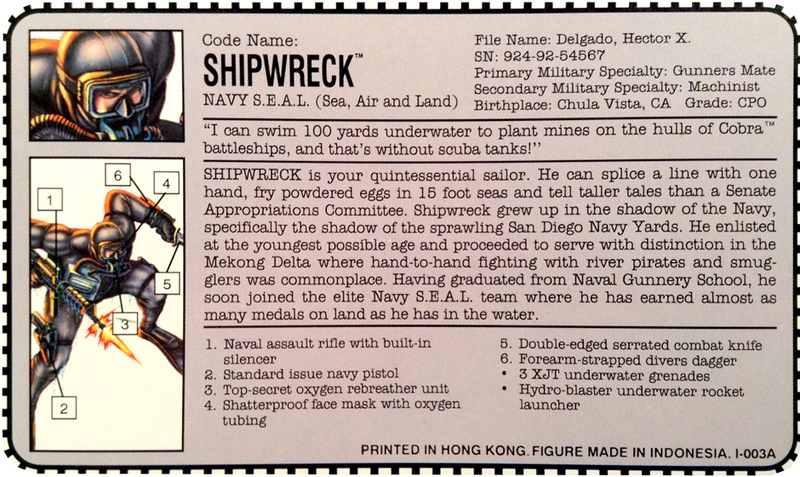 Shipwreck's black weapons tree included two rifles, a pistol, a knife, two missiles and a figure stand. An air mask, two flippers and a missile launcher were also included in the package. In 1994, Hasbro produced figures in China and Indonesia. This resulted in several paint app variants. To compound matters further, Hasbro also changed the card art on some figures from the older horizontal logo (with a red or blue laser backdrop) to a new vertical logo (with a red or blue to black gradient background). The back of the new card also featured a reformatted baseball card sized file card with condensed writing. Several figures did not get the new vertical card art treatment. Shipwreck did not get the vertical logo treatment. 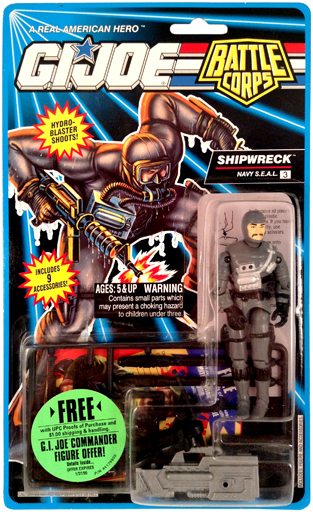 Shipwreck has two paint app versions: with black stripes on his upper arms, and without. The striped figure variant was made in China (see carded figure above), and the stripe-less variant was made in Indonesia (see carded figure below). 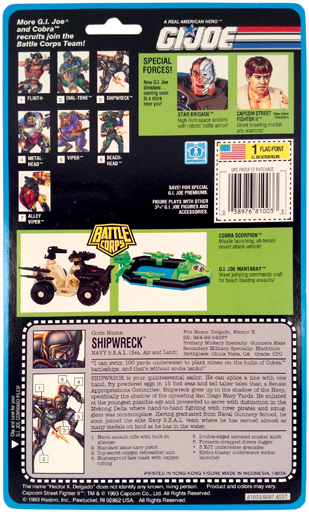 There are thirty+ known 1994 Battle Force variants featuring various packaging and paint app combinations. See them all on Facebook.